The first expansion for Magic the Gathering: Duels of the Planeswalkers has been out for just over a week now. Titled Duel the Dragon, the expansion adds some much needed variety to the original game, including another two-headed giant style co-op campaign. We've spent quite a bit of time with the expansion, and have our impressions to help you decide if it's a worthwhile purchase this crowded gaming season. What's Old Is New(er) Again: All of the original eight decks have additional unlockable cards. This may not seem like a big deal, but it's a way to help balance the original decks. I found the additions to range from excellent (Wrath of God for the White/Green/Red deck) to uninspiring (Onyx Goblet for the Black deck). These unlocks are yet another goal that will keep you playing these decks, and add a bit of variety to games. Three New Decks: By far the biggest addition, this brings the number of playable decks up to eleven. A modified version of the original campaign's end boss deck, blue/black and focused on artifacts, is one of the best. A red/green warrior-based aggro deck and a blue/white control deck round out the new selections. The blue/white deck especially is a great addition, giving a longtime Magic archetype representation in the game. I was less impressed with the red/green deck, and a bit disappointed that the blue/black artifact deck is considerably weaker than the version we've been playing against for so long. Each of these decks also include many cards to unlock. Short New Single Player and Co-Op Campaigns: Two new campaigns are now available, and separate from the original gauntlets. Both are quite short, the single player being five opponents long, and the co-op campaign a mere four duels. I was really expecting more, but it's clear the focus of this game is on multiplayer duels. The final boss, the dragon the expansion refers to, plays a decent blue/black/red deck, which is my favorite color combination. Too bad this deck isn't unlockable! Only Three New Puzzles: New puzzle challenges are available, but not many. I was able to solve these three puzzles quite quickly, though two of them are admittedly more difficult than the original ten. I've been a fan of "Magic: the Puzzling" since its introduction way back in Duelist magazine years ago. Playing these puzzles in a video game is easily the best way to enjoy them. Why not let players create their own, and share them over Xbox Live? This needs to happen! 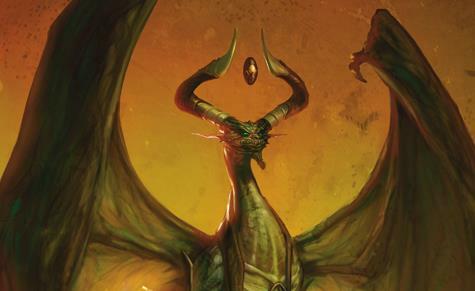 The Duel the Dragon expansion is priced at 400 points, half that of the original game. Is it worth it? Technically, Duel the Dragon contains less than half of what the original game did, so if you look at it from that perspective, it seems pricey. However, you could easily spend hundreds of hours in the original, and the expansion makes those hours all the more enjoyable. I feel like the original game is one of the best "bang for your buck" Arcade titles, and the expansion, particularly the new decks, is just one more reason to love it. If you enjoyed the original, you should definitely download Duel the Dragon.